Using simple ingredients, this Pico de Gallo is made and ready to eat in less than 10 minutes!! Pico de Gallo is very versatile and can be used as a topping for many different types of foods! Pico de Gallo is always best made fresh and it only keeps its freshness for a day or two. It’s simple and quick enough to make that it’s no hassle at all to make this delicious salsa right before you need it. It’s only made with just a few and readily available ingredients! Freshly made pico de gallo tastes great with tortilla chips, spooned over sauteed chicken, stuffed inside a cheesy quesadilla such as my Chicken, Bacon, and Cheese Quesadilla, or even mixed into a delicious morning omelette. TIP: Store in an airtight container and keep for only a day or two – it ensures optimal freshness for your recipes. How many jalapenos you add is up to you! Either adding 1 or two will make a difference and kick the heat up a notch in this recipe. Any way you choose to make it… it will be fresh and delicious! 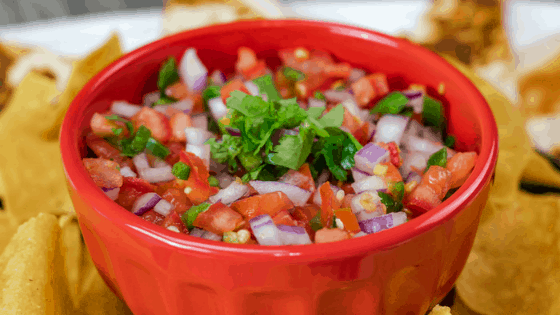 Using simple ingredients this Pico de Gallo is made and ready to eat in less than 10 minutes. Dice all ingredients into very small pieces. Simply mix together the tomatoes, onion, jalapenos and the salt. Stir in the lime juice, mixing well. Mix in the diced cilantro and blend well with other ingredients. Store in airtight container and consume with a day or two. it tastes best fresh!